Kelpie is overlooking a large reservoir whilst also being overlooked himself by a 15 century castle in the tiny mountain settlement of El Castell de Guadalest, nestled in the mountains not far off the coast at the Costa Blanca (38.6767263, -0.2006853). Our friends Wayne and Felixa had mentioned a small village in the mountains above Benidorm called Guadalest, where they said the views over the reservoir and the castle above the village were amazing. So with out route planned we set off from Villajoyosa and after a quick visit to Mercadona for the usual stock-up, we were on our way. Alan had driven the van over the mountains from France to Spain with little or no problem but I don’t think either he nor the van were prepared for the steep drive up to Guadalest. Our old Mercedes lorry base has a straight six cylinder 6.0l engine with no turbo. This is great for maintenance as there is little that can go wrong, which is why these engines commonly cover more than 1 million kilometres – but on hills they struggle. Most of the journey was driven in second gear, sometimes first, with an average speed of 10mph. It was a slow and sometimes nerve wrecking journey up through the mountains but when we finally arrived at the village of Guadalest it was well worth it. We’d been told there were two car parks, the upper one which was used by cars and tourist coaches on a daily basis and a lower area which was perfect for motorhomes. The car park attendant was of the opinion that we were too large to get turned into the gateway of the lower car park and instead directed us to the upper area. We parked beside another Dutch van and three coaches and went to look at the views. It never ceases to amaze me that in a perfectly ordinary looking town or street in Spain, you can turn a corner and be confronted by some of the most stunning scenery imaginable. The car park overlooked a huge reservoir and dam, of course the cameras came out immediately, but the pics we took don’t capture the half of how beautiful this area is. It’s breathtakingly beautiful and – silent, completely silent. We took a quick walk around the village but it seems that everything closes around 6pm for the day. Although we still managed to be relieved of some €20 in a little artisan (roughly translated that means expensive) shop that sold anything and everything that could be made from the locally grown fruit Nispiro, which looked like a cross between a peach and an apricot. We bought a jar of solid honey from bees which get their nectar from the flowering Nispiro trees (which tastes like Thornton’s Butter Tablet spread on toast) and a bottle of Nispiro Grappa – which I’m pretty sure was used to fuel the space shuttle before finding its way onto the shelves of that shop. Safe to say if we need anything de-greased or deep cleaned the grappa will come in useful – how much of it we will actually drink remains to be seen. We had a quick coffee and got our bearings, planning our tour for the next day and retired to the van for a couple of episodes of Game of Thrones. We’re getting through it rightly – most surprising of all is Alan (who doesn’t do TV) is watching and enjoying it. The altitude brought a drop in temperatures with a distinct chill in the air. There was still snow on top of the mountains surronding the village which twinkled like the the tiny white village around us. Next morning we’re up bright and early, not through choice I would say. Coaches bringing loads of tourists from the Costas and arrive in the car park at around 10.00am, but long before that we had a knock from the car park attendant saying we needed to move to the lower car park to make room for the coaches. Yes, the same car park he’d told us last night we were too big to get into! Luckily this time Alan was able to get a good swing at the entrance and got through the gate without any problem. A pretty steep slope took us down to the lower car park which only had two other motorhomes parked, so we had our choice of spot. Again the views over the reservoir were incredible. We decided to walk up through the village to see the castle and the views. Its a pretty steep climb up to the viewing point but well worth it as you can see from the pics. It appears that tourists and come by the coachload and take pics, have something to eat, check out the shops and go away again every day. 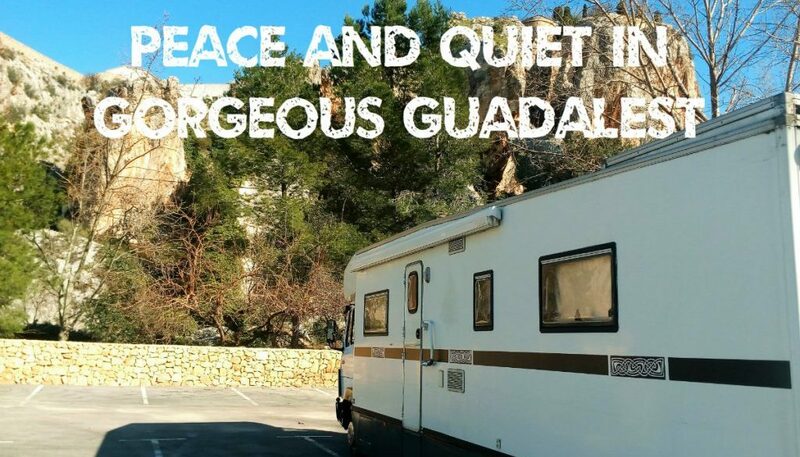 The shops close at 6pm and the staff go home – no one seems to live in Guadalest. Google says the population is 266 but we didn’t see anyone at all after 6pm. Because there are so many tourists visiting daily most of the shops were geared towards them. Selling souvenirs, Nispiro based products, woollen rugs and handbags – it reminded me very much of Mijas Pueblo on the Costa Del Sol. It also has its fair share of so-called “museums”. There were not one, but two miniatures museums, a medieval torture museum and believe it or not, a museum of salt and pepper cellars. You have to be prepared to see past these tourist magnets to appreciate the real beauty. One shop we noticed was an art gallery belonging to an artist called Joan Vidal – some of the most amazing pictures I’ve seen. I would love to have one in my home one day but unfortunately we just don’t have the room in the motorhome 🙂 . He paints landscapes but my favourite ones are the space/planets paintings done in fabulously bright colours – check out some of his work at www.joanvidal.com. Once you enter through the castle gate, which was tunnelled through the cliff, a fortress village of tiny white streets lies beyond, complete with the church. Although now mostly converted to “meet the needs” of the many tourists who visit, it still retains an authentic charm. As you climb up to the village square, you get a commanding view of the surrounding hills and valleys, both inland and back down to the sea, and it is easy to understand the strategic positioning of the settlement. One of the original buildings which lies behind the square is the old dungeon with a huge religious painting to make you ponder your sins, whilst you are chained up in a small cavern carved out of the rock. I loved Guadalest. It is a quiet and the remote location, but once you’ve seen the castle, town, reservoir and soaked up the mountain air, there’s no real reason to hang about. So we’re on the move again, back towards the microclimate of the coast where the temperatures are a few degrees warmer.